With Black Eyes and Broken Hearts Driving East chronicles the themes of youth in anthem like fashion: chasing dreams, breaking hearts, and having yours broken in return. Hailing from Fairfax, Virginia the members of Driving East bring an eclectic mix of influences and unyielding desire to their hard hitting style of punk pop. Driving East is quickly gaining a reputation as one of the true “comers” and most explosive live bands on the east coast. They bring with them a DIY play anywhere for anyone attitude and a work ethic to match. “We will truthfully play anywhere and everywhere. Literally, one night we were opening for Midtown and the next we were playing in front of 15 kids at a Chuck E. Cheese in the middle of nowhere. But every show and every crowd means just as much as the last. Whether it’s 15 or 1500 kids we love to play together and hopefully that comes across to the crowd,” drummer Jon Jester explains. Their hard work and attitude have started to pay off. In the year since their inception the boys have performed with national headliners such as Maroon 5, Sugarcult, Midtown, Fall Out Boy, The Early November, Homegrown, Allister, and many more earning fans and respect along the way. With appearances on local and national radio, in major newspapers, at prominent industry showcases, and the upcoming release of their debut EP the future is limitless for the band. After numerous line-up changes the band has grown into the unstoppable unit that steps on stage today. Jon Jester, the original drummer, moved to California to work with his friends in the South African band Just Jinger shortly after they signed with Capital Records. The lure of playing drums and chasing his dream eventually brought him back to the east coast and back to Driving East. Along with him came Aaron Hubbard, with a masters degree in music and upright bass in hand (You don’t see that in many punk bands, do you?) . The union of Jester, Hubbard, lead guitarist Jeff Streicher, guitarist/vocalist Nate Taylor, and lead vocalist Barrett Mullins make up Driving East today. 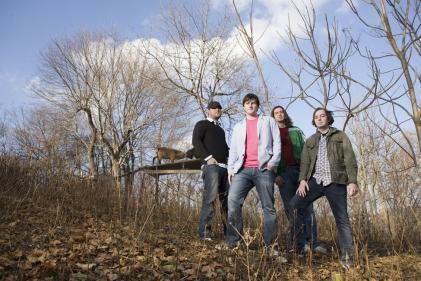 The band’s debut EP Black Eyes and Broken Hearts was produced by Matt Squire (Northstar, Orange Island, Thrice) and showcases the band’s unique brand of catchy, punk influenced rock. The driving beats, blazing guitars, and anthem like hooks add up to a collection of songs guaranteed to have you wanting to sing along and start a pit at the same time. “Many people try to write songs to get them on the radio but with Driving East what you’re hearing is what comes naturally to them,” says Squire. That ability brings a reality and truth to a genre of music that many times comes across as manufactured or fake.